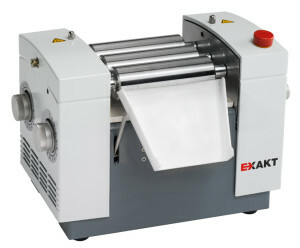 The EXAKT 50 I is an indispensable tool for the laboratory or small batch producer. The small three roll mill frame takes up little room on the lab bench, yet offers the operator the versatility of dispersing a wide variety of products. This unit is specially designed for quantities up to 7 liters per hour. Learn more about the 50I Three Roll Mill.